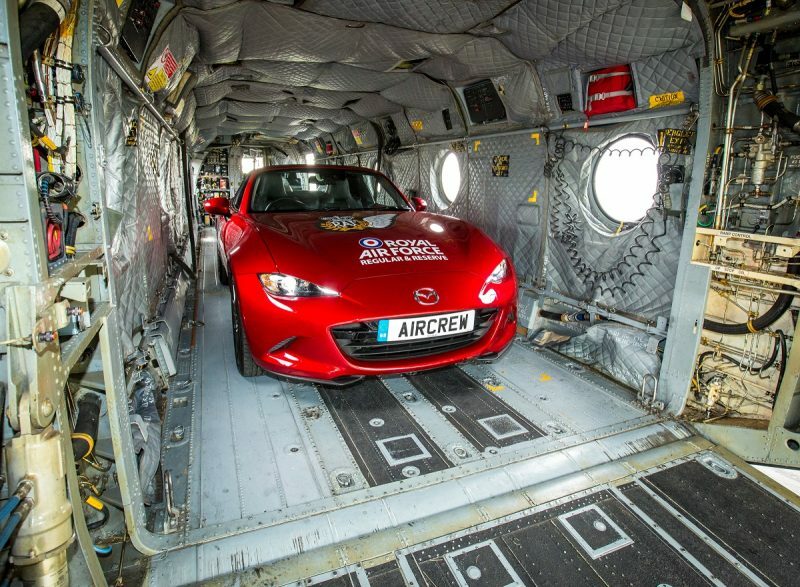 The all-new Mazda MX-5 RF has been touring the country helping the RAF recruit aircrew. 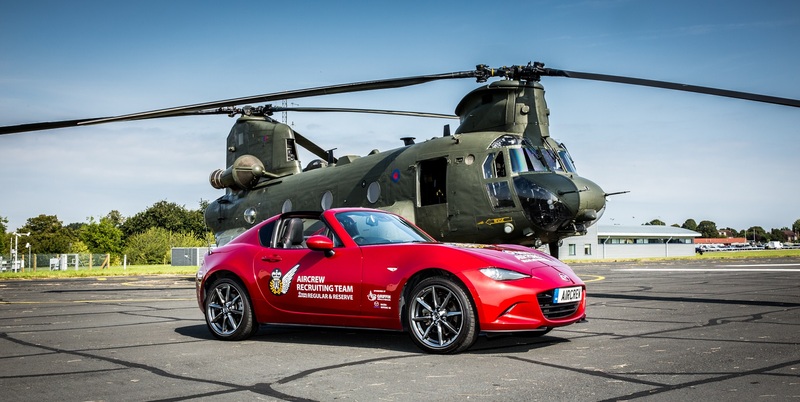 Flight Sergeant Liam Osmond reveals how Mazda’s latest sports car has raced a Chinook and driven the length and breadth of Britain doing its bit for the country. “I’m sitting on the runway at Royal Air Force Odiham in Hampshire and not quite sure what to expect. I’m inside the Mazda MX-5 RF but the roof is open. Somewhere behind I can hear a distant rumble. I’m given a signal by ground crew and start to rev the engine. Normally, the sporty sound is one of the appealing traits of the MX-5’s engine. But it’s completely drowned out by the deafening noise of air being displaced by the 18.3m diameter rotors of the approaching Chinook. By the time I select third gear, the Chinook is already past, on its way to a top speed of 196mph. At least racing it down the runway at Odiham in the MX-5 enabled me to hit 120mph before I had to start slowing down. It was proof, as if it was needed, that the MX-5 RF isn’t just all about jaw-dropping looks. But for most of its time with the RAF, it is the car’s stunning appearance that has worked in its – and our -favour. The popular roadster has an important role to play with the RAF. We’re currently on a recruitment drive to fill more than 60 aircrew roles. As the Aircrew Recruiting Team, we are primarily searching for the next generation of Weapon Systems Operators (WSOp). But it’s a bit more involved than simply hanging around on street corners and asking people to join up. We’ve been touring schools, graduate fairs and obviously air shows searching for ambitious, motivated people who have a sense of adventure. Wherever we’ve been, the all-new Mazda MX-5 RF has been the centrepiece of our display. And tens of thousands of people will have seen it. For example, during the Bournemouth Air Festival at the start of September, there were approximately 1.4 million visitors. Of course they won’t all have come to the RAF’s recruitment stand but even a relatively small percentage of that total is a huge number. During 2017 I’ve had the privilege of driving the RF all over the country to events like this. So far, we’ve covered just over 5,000 miles. We’ve driven it to the far north of Scotland and all the way down to Brands Hatch in Kent for the British Superbike round. 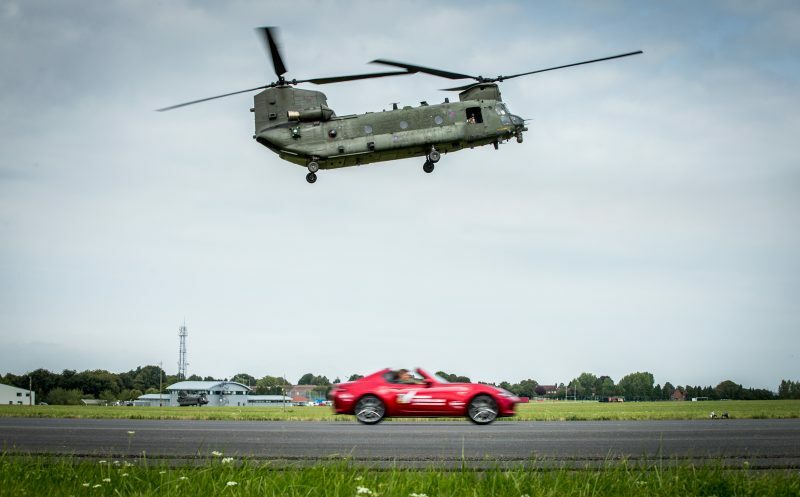 We’ve also taken it to Wings and Wheels at Dunsfold Park in Surrey where it met The Stig, from BBC Top Gear, and the Donington Park Classic Motorbike Festival. Throughout that time, it hasn’t missed a beat. And it’s been a comfortable travelling companion after a long day’s work; a sporty accomplice when I’ve been in the mood for fun. Perhaps more importantly, the two-seater’s striking looks have been a brilliant way of breaking the ice with young people. 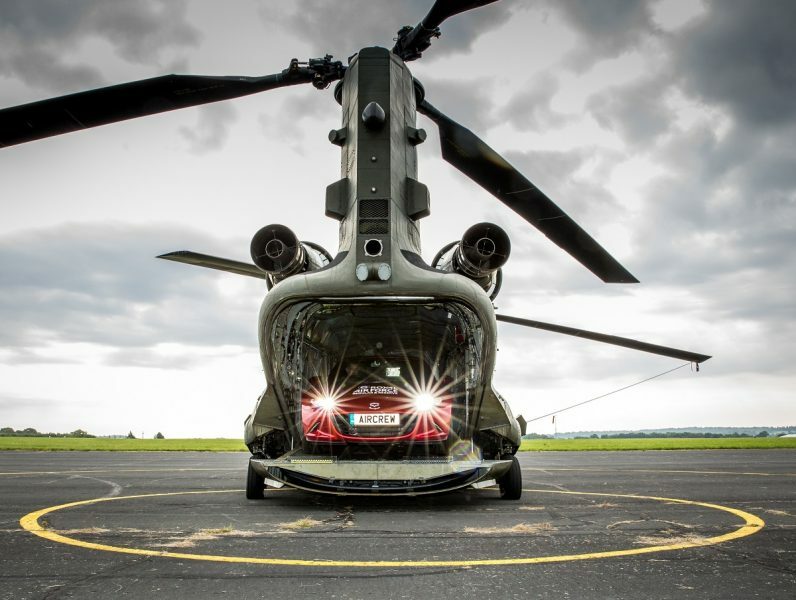 But what does a smart-looking sports car have in common with a career in the RAF? It’s quite simple really. If a young person signs up to a career in our service they will receive a competitive salary. Non-commissioned new recruits will earn around £14,000 during their basic training. After 21 weeks, the pay for Non Commissioned Aircrew (NCA) students jumps to just over £30,000. By the time they complete their aircrew training that will have gone up again to just under £34,000 plus other allowances. We know that money isn’t everything but a career in the Royal Air Force offers so much more: it’s a lifestyle choice. But our message is that if you work hard, a great car such as the MX-5 RF is very achievable, alongside all the other perks a career in the Royal Air Force has to offer. Weapon Systems Operators encompasses a number of roles within the aircrew world. As a WSOp they will be an integrated member of a mission crew. They might end up managing the air-to-air refuelling process on the Voyager aircraft. They could be on Chinook or Puma helicopters dealing with troops and cargo. Or they might be a sensor operator, responsible for radar and surveillance systems, operating cutting-edge technology on state of the art Intelligence Surveillance and Reconnaissance aircraft.